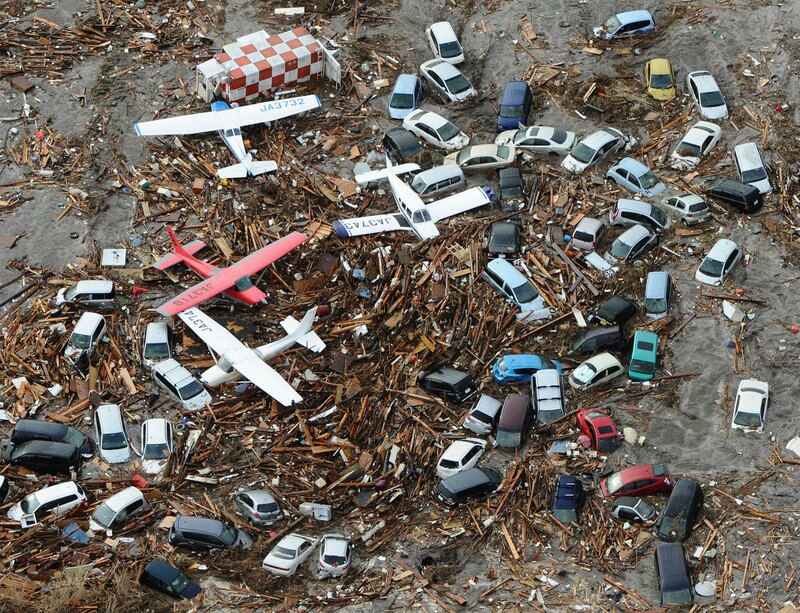 Light planes and vehicles sit among the debris after they were swept by a tsunami that struck Sendai airport in northern Japan on Friday March 11, 2011. Image by By Kansan Staff. Last month, six high school students from California visited Rikuzentakata, a city in Japan’s Iwate Prefecture that was nearly destroyed three years ago today by a massive earthquake and tsunami. On the agenda was a visit to Takata High School and its 20-foot boat, now home again after several years and a long voyage across the Pacific Ocean. The boat, which Takata High School used for marine science lessons, washed away during the tsunami and landed in Crescent City, California in April 2013. The Del Norte High School students, with the help of their teachers, restored the boat and worked alongside Del Norte County and various groups to return it to Japan. This tremendous story – a bright spot in an on-going human tragedy – is about friendship, cooperation, and bonds across an enormous ocean. For us in the NOAA Marine Debris Program, it’s also a reflection of the partnerships that have formed between responders here in the U.S. and our remarkable counterparts in Japan, as we enter the third year of addressing debris items that wash ashore. Debris from the tsunami is still washing ashore in the United States, but the amount is less than what we saw in previous years. Its arrival is widely scattered and unpredictable, in terms of what, when, and where, as it has been since the first piece of confirmed debris – a 170-foot squid vessel – showed up off the coast of British Columbia in March 2012. We expect this pattern to continue, until the debris eventually blends in with the marine debris that plagues our ocean every day. The remaining tsunami debris is not in a mass, so the dispersed items could swirl around with currents for years before reaching land. Or, they could sink, as much of it has likely already done. 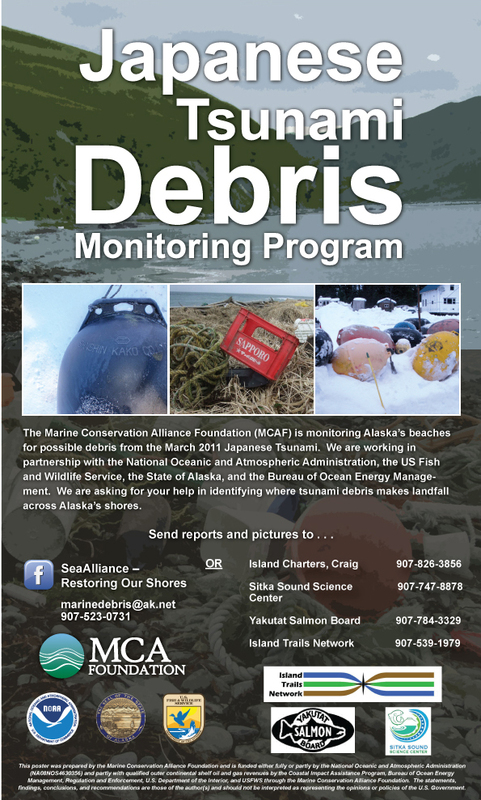 Over the past several years, Hawaii, California, Oregon, Washington, Alaska, and British Columbia have all seen varying amounts and types of debris gradually wash ashore. In some cases, near-identical pieces of debris washed up in different states months apart. NOAA has received nearly 2,000 debris reports to our DisasterDebris@noaa.gov email address, and as of today, we have confirmed 41 of those items to be tsunami debris, including vessels, buoys, sports balls, signs, canisters, floating piers, and a motorcycle in a shipping container. While there is likely much more tsunami debris out there, it’s very difficult to tell where debris comes from without unique identifying information. If a piece of debris is suspected to be from the tsunami, NOAA works with the Japanese government to identify these items if possible. As to whether or not this is what we expected, it’s safe to say yes – for the most part. I wrote two years ago, when we were first faced with this unprecedented situation, that we believed highly buoyant items would be the most likely to survive a trip across the ocean. That’s what we have seen. Since we did not know exactly what those items were or where they were, we prepared for all scenarios along with our state partners. What we perhaps did not realize, as we geared up our initial response, was how deep the partnerships between all stakeholders would become. As months went by and debris washed up piece by piece, the scenarios and plans turned to real action. The action became more routine and the coordination more efficient. What has happened, in the three years we have worked on this issue, is that we now have a solid network of marine debris responders in our Pacific states. Marine debris has always been a hot issue in this region, and groups from every corner of every state have worked on keeping debris out of the ocean for decades. This is the foundation for response when we experience significant, severe marine debris events from natural disasters. Federal partners, state and local agencies, tribes, academics, and even beachgoers have had a place in it. The unprecedented is now precedent. The Government of Japan and its consulates have been key partners, and we are grateful for the support they have lent us, even as they work to rebuild what was lost. 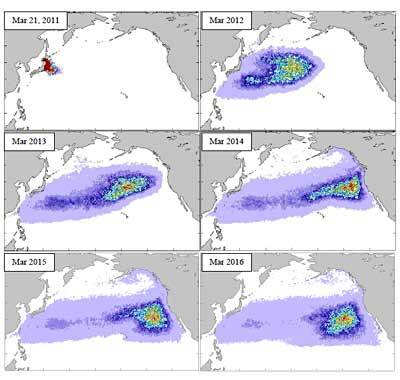 NOAA alone does not have the resources to launch a large-scale removal effort, but with the generous support of Japan, the cleanup can continue. The friendship and cooperation we have established will certainly play a role down the road as we continue to examine the larger marine debris issue. As the students from Del Norte High School found out, the ocean does not separate us from each other – it connects us – and that can be an advantage. The NOAA Marine Debris Program will continue to leverage this strong network and apply lessons learned as we move forward in the years to come. the probable pathways of the debris that entered the ocean on March 11, 2011, as estimated from historical trajectories of drifting buoys. Snapshots are shown projected each March from 2011 to 2016. This entry was posted in Disaster, World and tagged marine debris. Bookmark the permalink.